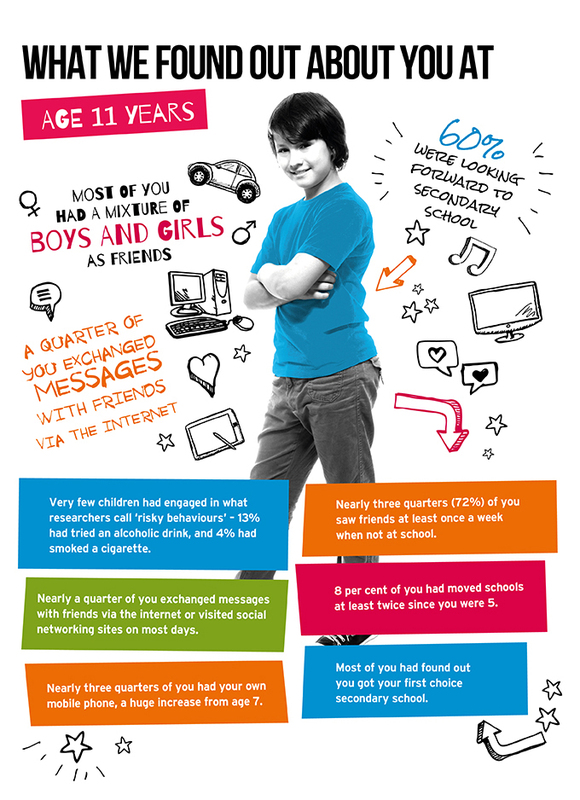 The Age 11 Survey took place in 2012, with 13,287 families and 13,469 young people taking part. Ipsos MORI interviewers carried out the survey in all countries. Age 11 marked the end of your childhood, a time when you were finishing primary school and starting a new chapter of your lives at secondary school. We wanted to be able both to look back throughout your childhood and to set the scene for your teenage years. Also by visiting you at age 11, as well as at ages 5 and 7, we captured your lives at the beginning, middle, and end of primary school, which is really important as so much changes during this period! What did we ask you? At age 11 we asked you to fill in a longer questionnaire than at age 7 as we wanted to hear more about your lives from you. We asked you about your friends, what you did in your spare time and how much you used the Internet and social networking sites, and what for (e.g. talking to friends or playing games). We also asked you how you felt about life, school and moving to secondary school, and your plans for the future. You answered questions about your health, attitudes and things that you might have tried. The interviewers weighed and measured you again. You completed some different activities at age 11, one about the meaning of words and two on a touch screen computer. As with the surveys when you were younger, we spoke to your parents at age 11 about home, family, health and work. If you lived in England or Wales we also asked if it was ok to send a questionnaire to your class teachers to ask about your school and how you were getting on. More than half of11-year-olds said they were ‘completely happy’ with their lives. The children of the new century are particularly satisfied with their family lives, with nearly three quarters of boys and girls saying they were ‘completely happy’ at home. Took place in 2012. 13,287 families and 13,469 children were interviewed. Ipsos MORI interviewers carried out the surveys in all countries.